I have a hard time living with someone that we don't agree on the thermostat. How do the Conways do it? Perhaps Kelly Anne is not as committed as she seems? Makes James Carville and Mary Matalin look like two peas in a pod. But seriously, it's just work for these folks. She has class and he is an Ummm. Saw the interview, she was dynamite. So damn smart .....truly amazing. ........and as a shallow aside she looks fabulous and has incredible taste in clothes. That suit was drop dead gorgeous. No doubt the tweeter finger will fly.......or maybe not. I think Trump is scared of her. 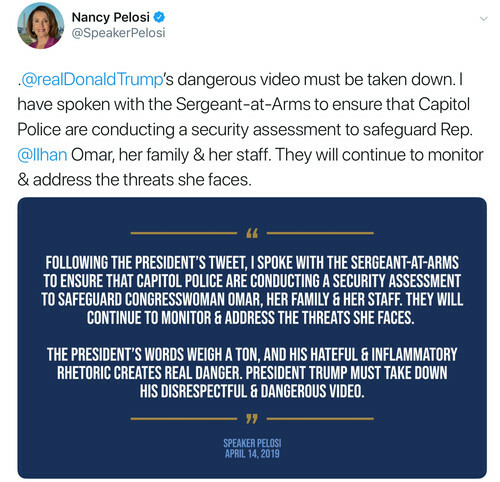 Pelosi has notified the Capitol police to secure Omar’s safety and demanded Trump’s video must be taken down. This will really get his goat. I saw Conway on MTP. She can't answer even very easy questions. All deflection and those "alternate" facts. She's good with "alternative facts". The rest of us call it lying. You must have "seen" the delusional version. On the MTP I saw, Conway was brilliant! I saw it too and she wasn’t successful flipping the subject. Todd stopped her dead in her tracks. She sure has a different story than Trump. I have to admit she has more common sense than Trump. Kelly Ann is a shrill, nasty piece of work, who lies for a living. It's a toss up whether she, Sarah Slanders or barbi doll Drumpf win the award for worst female in Donnie dementia's administration. Brilliant is subjective. Glad to know what you think Elvis lol. You are BRILLIANT! 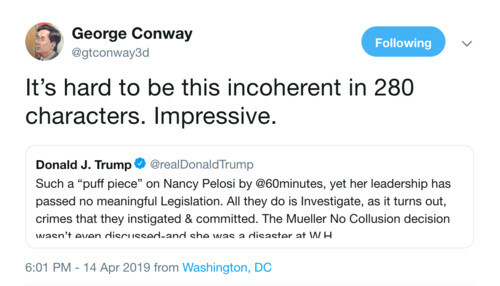 For a Republican, I gotta love George Conway. I never knew Repubs had a great sense of humor. He makes me laugh. It must be weird in that household. I have a cousin who lives in SC so I rarely saw her but we communicated regularly until November 2016. We probably will never speak again but that's okay. If she went to his rallies and supports him, she's no one I need in my life. I think both of them are auditioning for a reality show. Lily, I am in SC. Come visit me! Louise, I hope that is not your real name. There's a right wing poster that will track you down and post personal information about you here. Houzz will do nothing about that poster. It's happened to a few of us. Thank you for saying what I was thinking, SeaHorse. "There's a right wing poster that will track you down and post personal information about you here." Seahorse, I've been chatting here since before Obama's first term, and I've never seen any posts like that from anybody. I'm not suggesting that it hasn't happened, but after all this time, I would expect to have come across a few such posts. 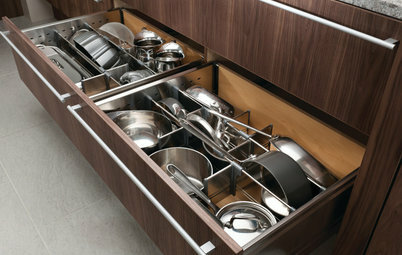 I am surprised by your claim that "Houzz will do nothing about that poster. It's happened to a few of us." I can't imagine anyone here not bringing such postings to the moderators immediately. And I really can't imagine the moderators ignoring such behavior. Are you sure you have the whole story? Another reminder to the right, personal anecdotes are not evidence. It happened. Thanks for watching! We will continue to do our work #ForThePeople. 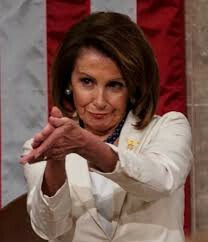 Pelosi hit it out of the ballpark on 60 Minutes. Love her. tRump's afraid of her. He can't say anything about her age because he's old too but she is remarkable. I'm very active too but not in 4-inch heels...Nikes for me. She's one smart cookie. I remember her dad when he was mayor of Baltimore. And notice he doesn't call her by anything but her real name...? 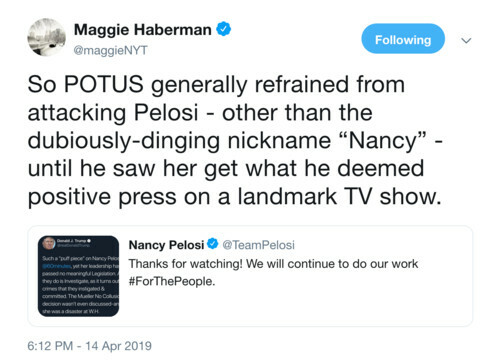 Nancy P was great on 60 Min last night. Carol, if you're off and on that could explain it.